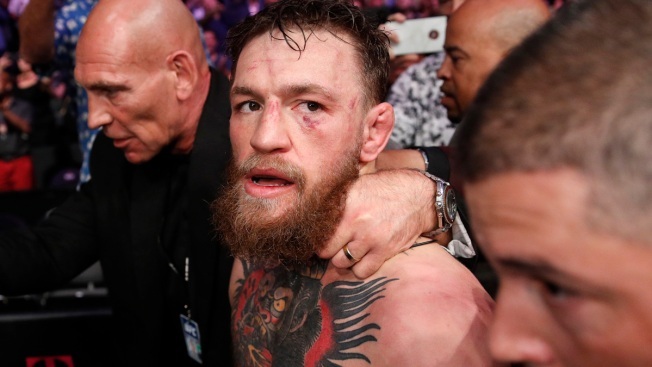 In this Oct. 6, 2018, file photo, Conor McGregor walks out of the arena after he was defeated by Khabib Nurmagomedov in a lightweight title mixed martial arts bout at UFC 229 in Las Vegas. Superstar UFC fighter McGregor has announced on social media that he is retiring from mixed martial arts. McGregor’s verified Twitter account had a post early Tuesday, March 26, 2019, that said the former featherweight and lightweight UFC champion was making a “quick announcement." Jimmy Fallon interviews Conor McGregor at Paddy Reilly's Music Bar, where they chat about the UFC champion's Proper No. Twelve whiskey, his days as a plumber long before becoming a notorious fighter and giving back. 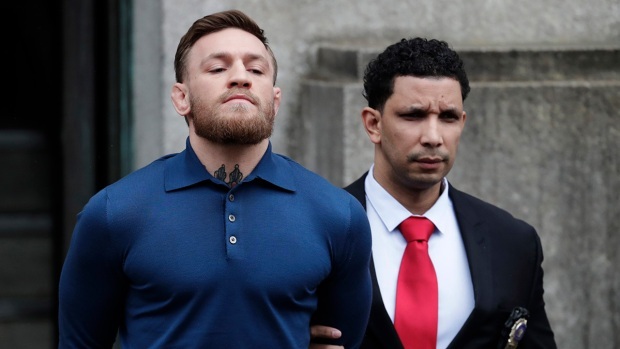 UFC star Conor McGregor is seen being walked from court in New York City Friday morning, with his hands cuffed behind his back. Several fans also showed up to voice their support for the MMA fighter.